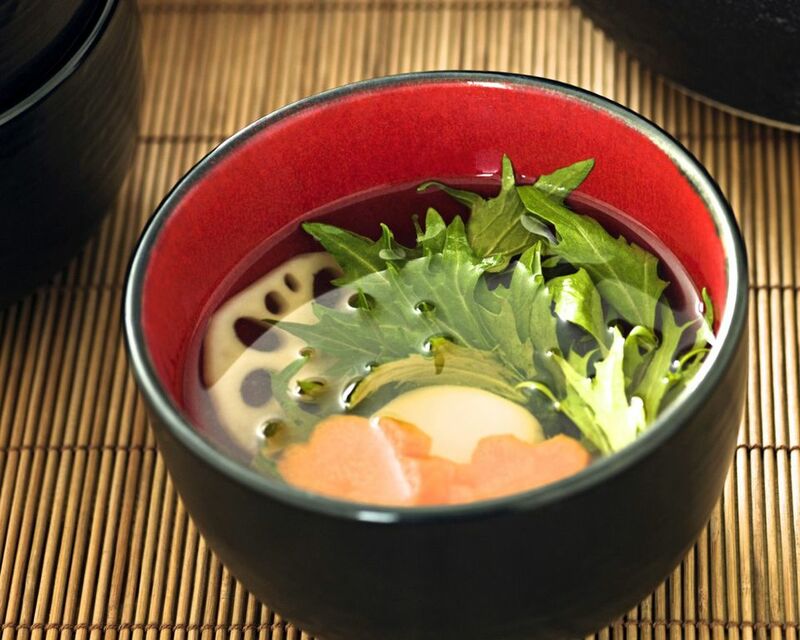 Many dishes in Japanese cuisine can easily be made vegan, as is the case for this traditional Japanese New Year's soup, known as zoni, also called ozoni (honorific term). Ozoni is a soup consisting of vegetables and mochi (rice cake) and may include chicken, fish, seafood, or kamaboko (fish cake) in non-vegan versions. Traditionally, the soup is enjoyed for breakfast, or as the first meal of the day. In a large stock pot, add the large piece of dried dashi konbu (seasoned kelp) and water, and allow this to steep for 30 minutes to 1 hour. Next, bring the konbu and water to a boil. Reduce heat to medium. Add dried konbu (kelp) dashi powder and soy sauce (to taste). Simmer for a few minutes. Add sliced carrots and daikon. Cook until the vegetables are tender (about 15 minutes). Remove the large piece of dried dashi konbu (seasoned kelp). Reduce heat to low. Add salt, and adjust to taste. Just before the ozoni is ready to be served, add a handful of the mizuna leaves, simmer for 2 to 3 minutes until it is just tender. If you are using fresh mochi, add it to the soup and allow it to cook for about 1 minute until the mochi is soft and pliable. Transfer it to an individual soup bowl and ladle vegetables and broth over it. Serve immediately. If the mochi is frozen, place the mochi on a plate with a small amount of water, then microwave it for 15 seconds or until its tender. Add the mochi to the stock pot and allow it to continue to cook for one minute until soft and pliable. Serve immediately with the broth and vegetables. Each family's ozoni soup differs slightly from the next, so feel free to incorporate other vegetables such as shiitake mushrooms, lotus root (renkon), spinach, etc. Similarly, adjust the amount of dried konbu (kelp) dashi powder seasoning, soy sauce (shoyu), and salt to suit your taste. Depending on the region of Japan, the base for ozoni soup, as well as the ingredients differ. For example, the soup base might be miso (fermented soy bean) based, clear dashi (bonito or kelp) based or even chicken stock based. Similarly, depending on the region, and family traditions, the types of vegetables included in the soup also differ. What makes ozoni unique from other soups is that one of the primary ingredients is a large piece of mochi or rice cake. Each serving of ozoni includes one piece of soft and chewy mochi.